Cote, M. et al., Clinical Sports Medicine 29 (2010) pp. 213-228. Abstracted by: Russell Hanks, PT, COMT, Anchorage, AK — Fellowship Candidate, IAOM-US Fellowship Program & Jean-Michel Brismée, PT, ScD, Fellowship Director, IAOM-US Fellowship program. Acromioclavicular joint (ACJ) separations make up approximately 9% of all injuries to the shoulder girdle in sports medicine and orthopedic practices.1-3 While grades I and II ACJ separations respond favorably to conservative treatment and Grade IV, V, VI require surgical intervention, there is however, considerable controversy regarding surgical versus nonoperative management of Grade III separations. This article attempts to provide a non-protocol rehabilitation strategy for ACJ separations for both preoperative and postoperative conditions with consideration given to anatomy, pathoanatomy and biological healing to determine progression of activity. A grade I separation involves a sprain of the ACJ ligaments without clavicle displacement, typically resulting in minimal insult to joint stability.1 The authors recommend no sling unless the patient is in acute pain. The criteria for discharge of the sling are no pain when the arm is at the patient’s side and during self-care activity. Mobility exercises are encouraged within the first week of injury and are progressed as the patient’s symptoms allow. 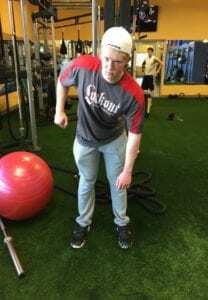 Internal rotation, horizontal adduction and end range shoulder flexion are cautiously progressed. Range of motion limitations greater than a week post injury in this category are rare and if they happen, other pathology should be considered. Strengthening is begun immediately and attention is placed on minimizing pain. 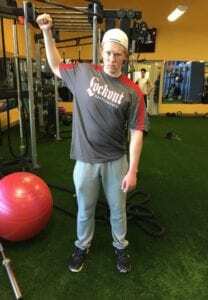 Closed chain scapular exercises to unload the weight of the arm and decrease stress on the rotator cuff are very helpful in this stage to progress strengthening with minimal pain. 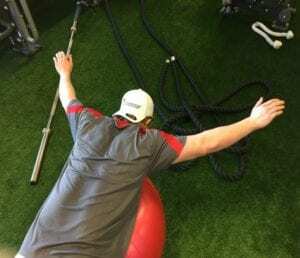 The term closed-chain refers to exercises in which the distal segment is fixed.4 In shoulder rehabilitation, closed-chain exercises involve movements with the hand fixed to a wall, table, or floor. 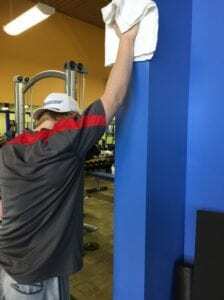 Exercises such as scapular clocks, isometric low rows and scapular protraction/retraction against a wall (Figures 1-4) are examples of closed chain movements. Grade II ACJ separation involves tearing of the ligaments (not the coracoclavicular ligaments) and possible increased anteroposterior translation of the clavicle.1 Immobilization acutely with a sling is only considered for management of pain and inflammation as described for Grade I sprains. Scapular strengthening is initiated to address the possible anterior and posterior translation of the clavicle. Emphasis is placed on scapular retraction to provide dynamic stability to the ACJ. The initiation of closed chain strengthening is preferred for the reasons stated for Grade I injuries. For example, scapular clocks (Figure 1) with the positioning of the fingers in the direction of 12:00/6:00 in this picture followed by the patient elevating and depressing the scapula in the direction of 12:00 and 6:00. 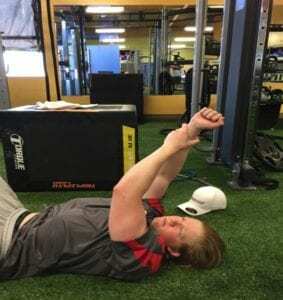 Scapular clocks can also be performed in the 3:00 or 9:00 position by internally or externally rotating the fingers into those positions and performing protraction and retraction of the scapula. 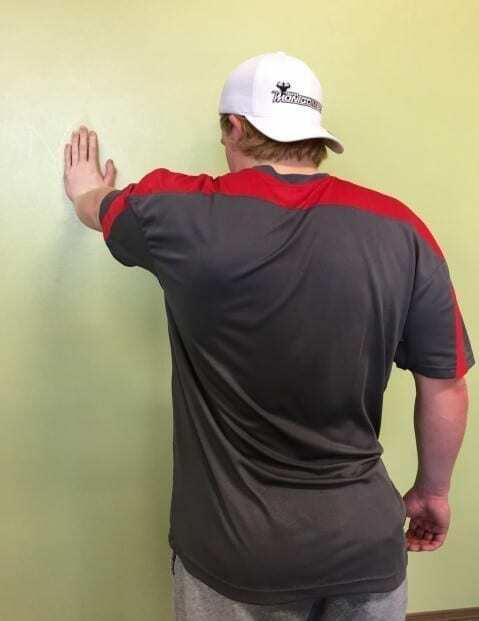 Each position is performed as an isometric exercise holding for 10 seconds or more depending on patient tolerance. Scapular retraction is progressed with rowing using tubing or cable resistance in order to integrate combined motions of the UE. 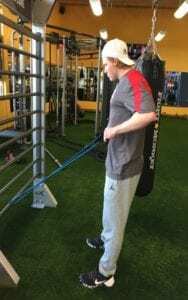 Activities to promote kinetic chain function with LE and trunk movements are initiated to promote normally occurring shoulder movements with the UE 5, 6 (Figures 10-14). 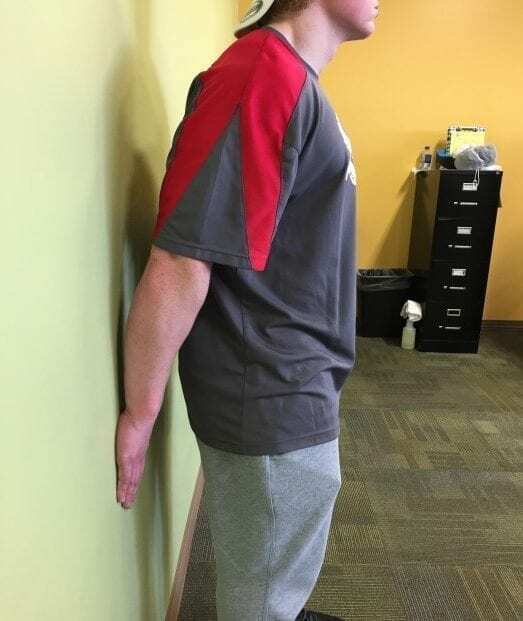 As the patient’s tolerance for forward flexion improves, the addition of horizontal abduction, external rotation and prone horizontal extension with the arm at 100 degrees can be introduced first without resistance and performed to fatigue (figures 8-9). Return to activity can occur when the patient can perform activity specific movements without pain. Grade III ACJ separations involve complete disruption of the acromioclavicular and coracoclavicular ligaments, resulting in 100% superior displacement of the clavicle.1 This review recommends a conservative approach to care over surgery primarily based on the lack of definitive data to support improved outcomes with operative management. Immobilization is very typical during the acute phases of this separation, but they are encouraged to minimize the use of a sling as symptoms will allow and begin rehabilitation immediately. 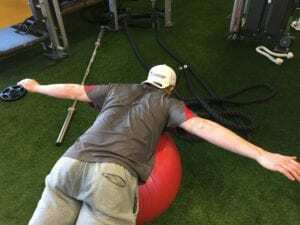 Scapular stabilization is essential to successful rehabilitation of nonoperative Grade III separations. The authors recommend 6 to 12 weeks of rehabilitation before a return to activity or consideration of surgical intervention, however they did note that if no progress toward functional restoration was seen at 6 weeks, it usually indicates the need for surgery. Braces that facilitate scapular retraction are recommended. A clavicle or figure-of-eight brace can be used to retract the scapula manually thus controlling excessive scapular protraction. The problem with this brace is that assistance is typically required to don and doff it, often leading to poor tolerance. Newer options include the S3 brace, which is a shirtlike compression device that is secured with adjustable neoprene and Velcro straps designed to promote a retracted position of the scapula. Strapless postural apparel such as “IntelliSkin proprioposture support” is also a useful tool to facilitate rehabilitation and encourage scapular retraction. Grades IV, V, and VI are treated operatively with anatomic coracoclavicular reconstruction (ACCR). Some patients have opted out of surgery and have achieved some limited success with the nonoperative guidelines proposed. Some of the reasons for this include, one, these patients tend to be more than 55 years of age and are generally involved in activities that place low demand on the shoulder. Two, there may be some selection bias as these patients were resistant to operative intervention and self-selected a course of nonoperative management. The diagnostic criteria to distinguish between a grade III and grade V separation may inadvertently lead to a false-negative result. A grade V separation results in 300% displacement of the clavicle, whereas a grade III accounts for 100%.1 In cases in which a clavicular displacement exceeds 100% the diagnosis of grade V may be made regardless of whether the displacement meets the 300% that defines a true grade V.
The goal of this surgery is to restore the anatomy and return stability to the joint. The coracoclavicular ligaments are reconstructed with a soft tissue allograft that is passed under the coracoid and through 2 bone tunnels that have been drilled into the clavicle at the approximate insertion site of the original ligaments. Each is fixated by an interference anchor in each tunnel. Progression of activities following ACCR is based upon tissue healing timeframes for tendon healing in a bone tunnel 8, 9 Preoperatively the patients are instructed on the use of a brace and show a home program of wrist/hand and elbow exercise. Postoperatively, the patient is immobilized continuously in an unloading platform brace (Lerman Shoulder Orthosis, DonJoy Inc, Vista, CA, USA) for 6-8 weeks. 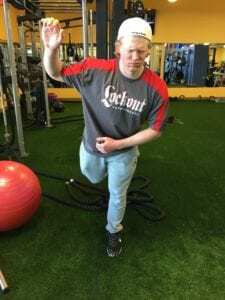 After this time period, the patient begins rehabilitation of active assisted ROM exercises in all planes of movement with caution placed on end range movements, internal rotation and cross body adduction based on the patient’s tolerance. Closed chain exercises are generally tolerated well due to the decreased shoulder-muscle activation like table or wall slides 10 (Figures 15-18). Emphasis is placed on scapular exercise and kinetic chain activity beginning at 8 weeks. No isotonic strengthening for 12 weeks at which time multi-level rows and trunk and LE kinetic chain exercises are appropriate. At 10 weeks postoperatively, it is the author’s experience that ROM limitations are minimal. 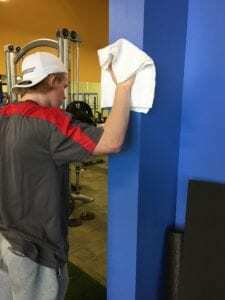 Typically, IR may be limited and towel stretches behind the back are allowed if scapular retraction can be maintained. They also feel that limitations of motion are related to ACJ mechanics postsurgically rather than a GHJ capsular limitation. Rehabilitation is an important part of the management of any grade separation of the AC joint. Guidelines for rehab are determined through an understanding of anatomy, pathoanatomy and biologic healing. Determining what to do with each AC joint sprain is relatively easy once you have determined its severity. Determining its severity, however, is the challenge. Successful treatment begins with an accurate diagnosis. IAOM was founded upon teaching diagnostic testing and treatment. The point of the article was to describe a protocol for each grade of separation for the AC joint. We know that techniques are not enough. What to do only becomes important when you know why. IAOM teaches structural diagnosis, functional diagnosis, biopsychosocial assessment, fundamental activation, neural mobilization, strategic communication as a clinical tool and sensory motor control rehabilitation strategies. 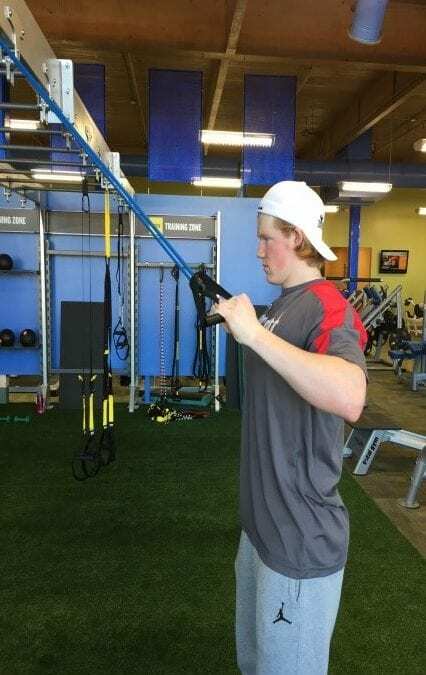 For instability, emphasize weight bearing exercises early in the rehabilitation to establish centering and control of the humeral head, which allows for more efficient work of the scapular stabilizers and rotator cuff muscles. 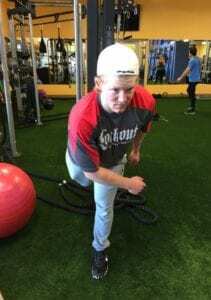 Early on, emphasize endurance and control and progress towards tendon hypertrophy with hundreds of reps. Progress towards more functional open chain movements over time and as symptoms improve. As you near functional/athletic return, begin to incorporate more power and strength exercises. Lastly, don’t forget to explain the rationale behind your rehabilitation choices to your patient. When they understand its purpose, they are more likely to buy in to what you are doing, develop trust in your ability to help them and relax in the comfort that you have a plan to help them return to play and function. 1 Rockwood CJ, Williams G, Young D. Disorders of the acromioclavicular joint. In: Rockwood CJ, Matsen FA III, editors. The shoulder. 2nd edition. Philadelphia: WB Saunders; 1998. p. 483–553. 2 Mazzocca AD, Arciero RA, Bicos J. Evaluation and treatment of acromioclavicular joint injuries. 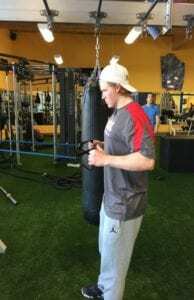 Am J Sports Med 2007;35(2):316–29. 3 Trainer G, Arciero RA, Mazzocca AD. Practical management of grade III Acromioclavicular separations. Clin J Sport Med 2008;18(2):162–6. 5 McMullen J, Uhl TL. 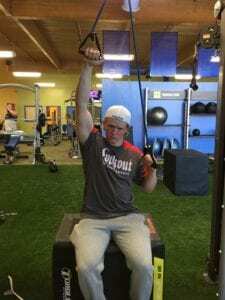 A kinetic chain approach for shoulder rehabilitation. J Athl Train 2000;35:329–37. 6 Kibler WB, Livingston BP. 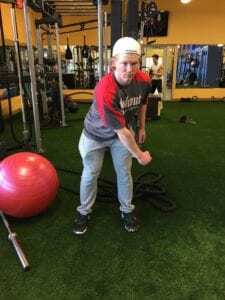 Closed chain rehabilitation for the upper and lower extremity. J Am Acad Orthop Surg 2001;9:412–21. 7 Gumina S, Carbone S, Postacchini F. Scapular dyskinesis and SICK scapula syndrome in patients with chronic type III acromioclavicular dislocation. Arthroscopy 2009;25(1):40–5. 8 Rodeo SA, Arnoczky SP, Torzilli PA, et al. Tendon-healing in a bone tunnel. A biomechanical and histological study in the dog. J Bone Joint Surg Am 1993;75(12):1795–803. 9 St Pierre P, Olson EJ, Elliott JJ, et al. Tendon-healing to cortical bone compared with healing to a cancellous trough. A biomechanical and histological evaluation in goats. J Bone Joint Surg Am 1995;77(12):1858–66. 10 Wise MB, Uhl TL, Mattacola CG, et al. The effect of limb support on muscle activation during shoulder exercises. J Shoulder Elbow Surg 2004;13(6):614–20. 11 Lister JL, et al. 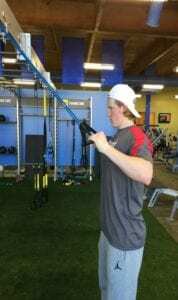 Scapular stabilizer activity during Bodyblade, cuff weights, and Thera-band use. J Sport Rehabil. 2007 Feb; 16(1):50-67.